Once you get to “think like a bass”, you’ll catch and release more fish like this. GAINING a working understanding of river bass is vital, and fortunately, fairly straight forward. Once you get to “think like a bass”, you’ll catch (and hopefully release) more fish and spend less effort doing it. During daylight hours bass seek shelter and are rarely found cruising the open shallows, and for good reason; predators target bass and it’s not only the small fry that get nabbed. On a very tough and fishless session at The Gorge (Copmanhurst, NSW), the only bass I saw for the morning was a solid one and it was flapping from the talons of a river eagle! 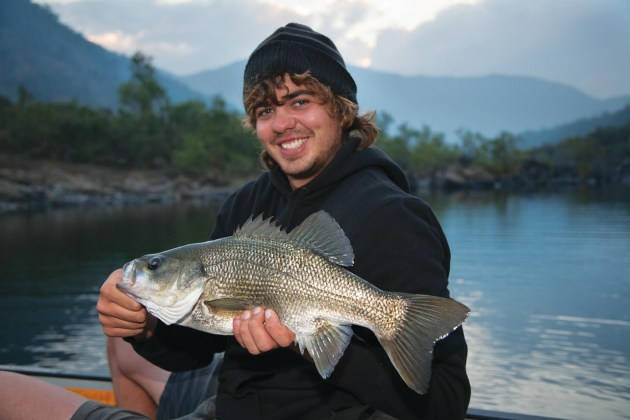 Bass feed by ambushing prey during the daylight so, like mulloway, they hold around structure and chase creatures that come to their notice. The trick is to target structure and fish it appropriately. For example, deep water structure such as vertical rock faces are best fished with lures that will sink beside the rock, all the way to the bottom because most fish will be where rock meets bottom. Diving minnows would be OK as long as they were cast parallel to the rock face, but casting into the rocks wouldn’t be as good because the lure would be away from the by the time it has dived deep enough. The depth of water is an important factor in choosing the most suitable style of lure. Areas of deeper water are classic places to find bass. They are relatively easy to spot when wearing a pair of polarised sunglasses because, without the scatter of glare reflecting off the surface of the water, you can recognise deep water by its darker colour, and in many cases the lack of riverbed. The important thing to remember about water depth is that the actual depth of the water is not important, it’s the depth relative to the surrounding water. Depth becomes most important when fishing shallow rivers. For example, in a knee-deep waterway, a 1–2 m pocket is very significant whereas a 10 m deep hole probably has less influence on the fish if the whole area has water that’s 5 m deep. However, the actual depth of water is very important to the style of lure that’s best suited to the area. First up, when I’m fishing a shallow stretch of water I know that the bass will be skittish and easily scared, so I’ll keep clear of heavy lures and stick to lightweight options because the disturbance and noise created by a heavy lure splashing down onto the water is sufficient to upset the fish. Obviously, I’ll also avoid deep diving hardbodies because they’ll dive straight into the bottom or submerged timber and lose their action or become snagged. Surface lures are an option for shallow areas and they’ll often draw a strike from fish lying in a deeper hole, so they are worth a try. Alternatively, vibes and bladed lures such as spinnerbaits and blade-carrying jigheads can be worked at any depth you choose by varying the sink time, speed of retrieve and rod angle. By winding as soon as they hit the water, with a brisk rate of retrieve and an upright rod, sinking lures will stick at the surface. With longer sink times, lower rod angles and slower retrieves, lures can be kept anywhere between the surface and the bottom. The only problem with spinnerbaits in shallow rivers results from the splash upon impacts, but small-bladed jig heads with a 2” – 3” paddle tail plastics (clear or dark) solve the problem. In a small waterway, they can be well ahead, for a small splash, and then worked at the depth required. The most reliable way to catch big bass is to fish for them after dark. A group of boulders or a rocky outcrop rising up from the riverbed are prime structures and all the better if the rocks are visible from a distance because you can cast ahead without disturbing the fish. Don’t despair though if you first spot them below because they can be revisited ten minutes later. If you are quiet and patient, the bass might resume patrolling the structure fairly well straight away and it’s not unheard of to jig a few out in plain sight. My boys did just that when they were little tackers; whilst I held the canoe beside a big boulder, we watched a school of about twenty bass do circuits of the rock, appearing every minute or so. Each time they came around the boys dropped a small curl tail plastic in their faces and we caught about ten fish before they wised up. There’s no one lure type to use in this situation. Diving minnows, spinnerbaits, plastics and surface lures all produce at times, so it’s a matter of having a few lures ready to go and experimenting. Personally, I tend to use ¼ oz spinnerbaits with a 2–3” paddle tail plastic, rigged on two hooks, in rocky locations because they are less prone to snagging and can be fished at the varied depths that usually accompany rocky rivers. Black or dark brown is my go-to colour, but often it’s a white or silver plastic that is most productive. Simply cast to the spot, allow time for the lure to sink to the desired depth and slowly retrieve…nothing tricky about it! Sometimes I hop the lure along the bottom by gently raising the rod tip, then winding back the slack when the tip is lowered back down…bass will strike readily at a sinking spinnerbait. Whatever way you retrieve these lures the catch word is SLOW…move it just enough to spin the blades, and no faster. With a graphite rod and braid you can feel when the blades turn. If you're patient and keep at it, bass like tgihs will follow. I’m at home fishing this stuff because that’s the structure most common in the rivers around home. 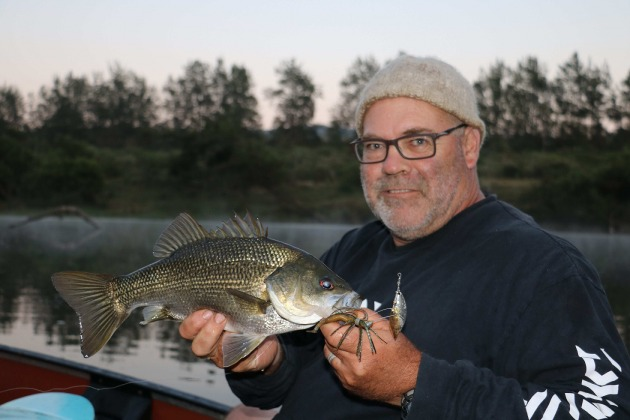 Catching bass amongst the timber is a scenario that involves accurate casting and there is great satisfaction to be had from a cracker cast, even without a strike. Beware however, the more difficult the cast, the more of them you’ll miss, so be patient and keep at it. What you are looking for amongst the branches is a clear nook back behind the edge of the snag with a laneway of clear space allowing for a cast. Often, access requires a cast with a low trajectory under overhanging branches, via a narrow gap between branches or a skip cast over a branch lying just above the surface. The area of water doesn’t have to be large, just enough room to get a few wiggles out of the lure because bass will hit the lure quickly if they are in the mood. No matter what type of space or you how you get a lure into it, once hooked, you’ll need a heavy-handed approach to drag fish into the clear, don’t be vicious but don’t hesitate either. If a bass gets its head amongst a snag, there’s a good chance it will cut the line or hook the lure into wood. Once the fish is coming your way, do your best to keep it coming until it’s clear of danger and then ease up and enjoy the fight. Fishing amongst fallen timber is a scenario that lends itself to just about any lure, but some work better than others. For example, spinnerbaits work well because they are less prone to snagging on the timber than lures carrying trebles, and can be gently bumped over branches, right where the fish are. But they are harder to cast accurately because the blades spin in the air during a cast, causing the lure to veer to one side or the other. Plastics and vibes are dead easy to cast but are terrible at snagging and small surface lures that require light spin gear to put them where you want them…make it hard to land bigger fish. Shallow diving, floating hardbodies are a lure of choice amongst the wood because they are easy to cast, they can be blasted through thin vegetation and bass love them. To get the most out of a floating hardbody, let the lure settle after a cast and then give it the gentlest of nudges as it lays on the surface, then if nothing happens, tickle the lure back whilst imparting an irregular vibration with the rod tip. If you feel the lure nudge against timber, pause the retrieve until it floats up above the branch and then continue. 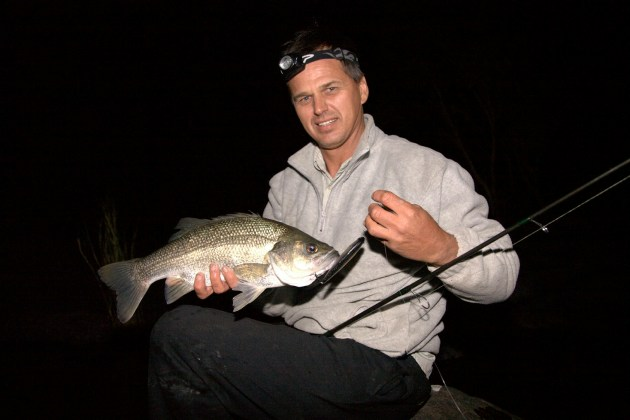 Lures such as the Knoll’s Native (5 cm) are a favourite for many anglers because they move backwards as they rise…but they aren’t readily available these days. Smaller hard bodies are popular and they are very effective, particularly on spin gear. There’s usually bass on the edges of most rapids, and from a moving canoe, landing one is always exciting. Look for small eddies behind rocks and try to put a lure into it as you move down the rapid. The battle usually involves the rod going back over the shoulder at some point, with concentration being split between a safe passage and the fish. Usually, the fish is dragged into the flow and is landed in the pool below. It’s not easy when travelling solo, so it is best avoided in rapids that carry a punch, but with two on board the angler in the bow is best positioned to have a go. Of course, there’s usually no problem beaching the water craft before or after the rapid and fishing from the bank. Bass love weed beds far more than anglers do. They can be nasty places to fish, particularly during drought when water levels are low, but they are sometimes the best place to find bass. Surface lures are the best lures to use over weed, even during the day. In the dark, a pause/slow retrieve is ideal, with most fish striking on the first movement after a pause. The longer the pause the better. During daylight, particularly as the sun gets higher, moving the lure can be a bad thing. Quite often, more fish will hit a lure that lands and stays still, with success coming only when the angler can control the urge to move it. Waits of a minute or two are common, perhaps resulting from fish needing time to find it or the fact that they get aggravated by the intruder into their space. Once hooked, the fun starts because they dive straight back at the weed and if they beat you, a quick paddle and drag on the leader is about all you can do to get them clear…not quite kosher, but effective! Whilst not structural consideration in the strict sense, shallow and skinny waters do require consideration when choosing a style of lure. Fish living in these conditions are flighty and can be spooked by the commotion resulting from a larger lure hitting the surface, so smaller lures are worth considering. Two common styles are small surface lures and small soft plastics used in conjunction with a bladed jig head. Small animal imitations and propeller carrying hardbodies can be cast well ahead on spin gear and enable river edges, snags and shady pockets to be explored prior to being disturbed by the angler. Bladed soft plastics worked in any part of the river, be it a deeper hole, snag or shade. In terms of depth, a river running knee deep might have isolated pockets of water up to 1 m deep and you should consider these as fish holding locations. The most reliable way to catch big bass is to fish for them after dark and the optimal lure is a black surface lure in the 70 –110 mm range. Primarily, cast at snags and the bank without casting too far or too short … easier said than done, but fish will also be found cruising the shallows. Retrieves must include the big pause and wait upon landing followed by a steady and slow retrieve punctuated with further pauses. The majority of fish will be hooked at the first movement after a pause and the next soaking an angler receives by a bass hitting the lure as it reached the rod tip will not be the last! Shade has been placed last in the list because its presence enhances all previously mentioned scenarios, although deep water locations least. 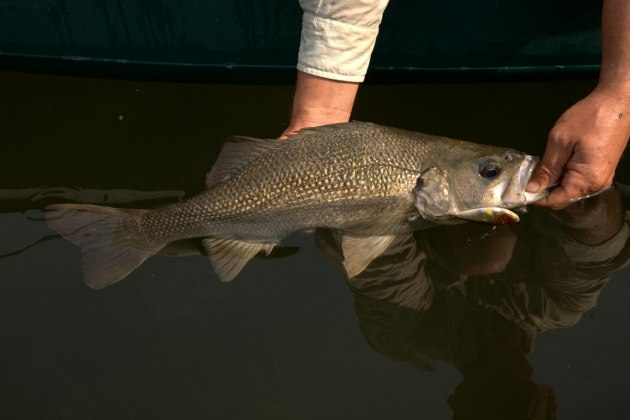 Targeting shades areas as opposed to spots in full sun can mean the difference between the odd bass and many bass. If having option, most bass would seek the shady areas and if two snags were identical in every way except for shade, it would be expected that more fish would be on the shaded snag. For example, a shaded corner of a timber snag, or the shade produced from a reed-lined bank or even shade by itself, is worth putting a lure into. Lure types are determined as previously explained. A shady bass angler is the best bass angler!